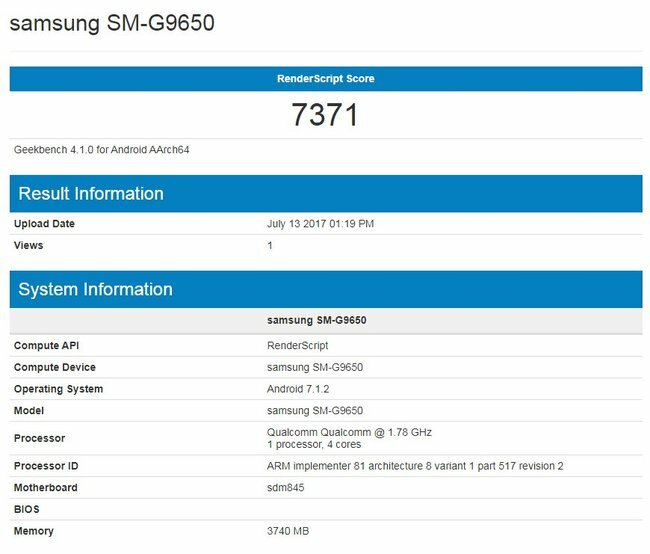 Samsung SM-G9650 Geekbench Listing Suggests It Could be Samsung Galaxy S9 - Playfuldroid! The Samsung Galaxy S9 is slated to get announced in the coming year, most likely in the first quarter. However, it seems that the Galaxy S9 has paid an early visit on Geekbench as a new smartphone labeled as Samsung SM-G9650 has appeared on the benchmarking site. The SM-G9650 is driven by sdm845 that features a quad-core processor that clocks at 1.78 GHz. The sdm845 chip could be the Snapdragon 845 that is expected to power the next S series flagship from Samsung that will launch in 2018. The Samsung Galaxy S8 has a model number of SM-G9550 and it seems that the newly spotted SM-G9650 could be the model number of Samsung Galaxy S9. The sdm845 on SM-G9650 is supported by 4 GB of RAM and it is running on Android 7.1.2 Nougat. It is has scored a render script score of 7371 which is quite low compared to the Galaxy S8 that has scored over 9000. Early rumors have revealed that the Samsung Galaxy S9 and Galaxy S9+ are codenamed as Star and Star 2. These phones are expected to sport dual rear cameras and front-mounted fingerprint reader.